Pregnancy or Antenatal Massage is offered after your first 3 months of pregnancy. Prior to receiving massage you should consult your doctor or midwife to ensure they are happy for you to have massage during your pregnancy. Peapodbaby offers antenatal holistic massage which can include use of essential oils to help relieve aches and pains, decrease swelling, reduce stress and aid relaxation during pregnancy. During your pregnancy, regular massages can help you cope with discomfort of neck and back pain, joint pain, leg cramping and pelvic pain. In addition, massages will encourage blood and lymph circulation, reduce stress on weight-bearing joints and help to relax nervous tension which can benefit your sleep. Learning to relax through massage can also help you to prepare for labour and birth. Jane has been midwife for almost 30 years and has additional training in holistic massage, pregnancy massage and aromatherapy in pregnancy. We are accredited with the Guild of Holistic + Beauty Therapists. Peapodbaby also offer holistic massage to new mums in the postnatal period to reduce discomfort, boost healing and reduce stress after the strain of labour and birth. 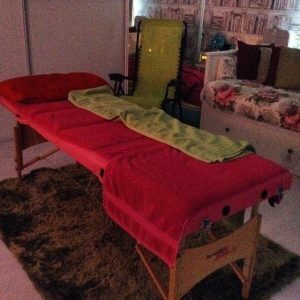 Peapodbaby offer pregnancy and postnatal massage as a one-to-one session in the therapist’s home in Dundee and each session lasts approximately 1 hour. Your first appointment is a little longer as we include a holistic consultation that ensures the massage is suitable for your individual needs. Peapodbaby are able to provide a flexible service to suit busy lives and we can offer a variety of daytime, evening or weekend appointments. Please contact us using the form below or you can email us at [email protected] if you would like any more information or wish to arrange an appointment.